BNP secretary general Mirza Fakhrul Islam Alamgir on Saturday said their party has been passing through a critical juncture due to the current government’s ‘misrule’. “BNP has been going through a critical time since our chairperson Khaleda Zia has been kept in jail in false cases due to a plot by the government which imposed misrule on people by usurping power,” he said. 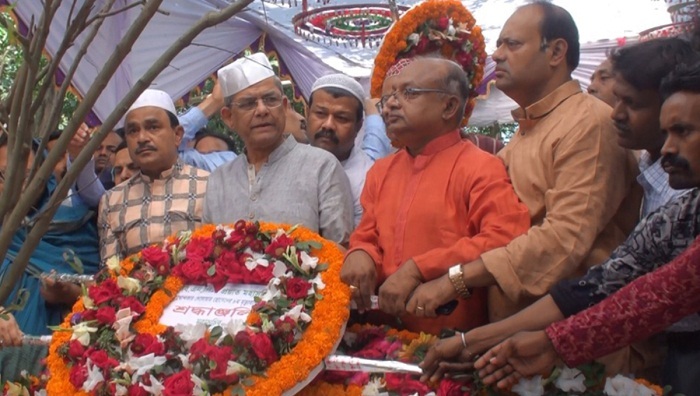 Fakhrul came up with the remarks while talking to reporters after placing a wreath at the grave of former BNP secretary general Khandaker Delwar Hossain in the district’s Pachuria, marking the eight death anniversary of the late leader. To overcome the current situation, the BNP leader said they are now working to reorganise their party. He said their party will intensify their movement for ensuring the release of Khaleda Zia from jail and restoring people’s lost rights. “We’ll dislodge the current fascist and autocratic regime through a movement together with people,” the BNP leader said. Fakhrul said their party is proud of being the full member of Asia Pacific Democrat Union (APDU), and hoped that the organisation will play a positive role in ‘restoring’ democracy in Bangladesh. BNP’s status was upgraded from associate to full membership at a meeting of the APDU Council in Colombo on Friday while Fakhrul was elected one of the three vice-chairmen of the organisation. Fakhrul recalled Khandaker Delwar’s role in keeping the party organised during the 1/11 political changeover. The BNP secretary general along with party’s joint secretaries general Khandaker Mahbubuddin Khokon and Syed Moazzem Hossain Alal reached Pachuria around 1:30 pm. They together with local BNP leaders placed a wreath at Delwar’s grave and offered fateha there on the occasion.